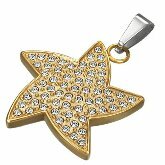 Our Starfish pendant and necklace collection holds a special place in our hearts. Starfish or Sea Stars remind us of the beach - the doorway to the mysterious watery world. They also remind us what nature has gifted our world - variety in life. Sea Stars are one of the most beautiful creatures in the ocean. They vary greatly in shape, size, colors and patterns. Most Sea Stars have five rays or arms. Yet out of this basic five-arm shape, arises unbelievable variety and beauty. 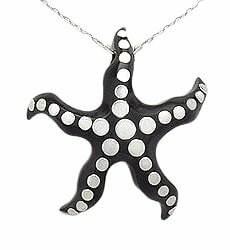 And that is what I will be showing you, beauty and variety, through Sea Star pendants and necklaces. All from a basic five-ray shape. 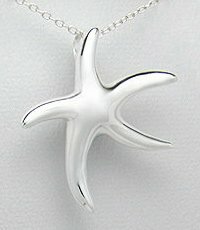 The silver pendants are grouped according to matching chains. 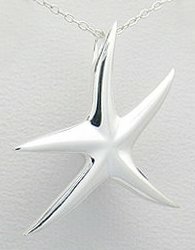 To purchase a sterling silver starfish necklace, purchase the pendant by clicking its 'Add to Cart' button. 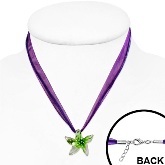 Then click on the chain images to order them on the 'chain' page. 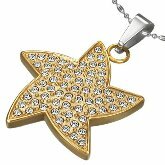 Take note of the 15% discount on chains when purchased with a silver pendant. 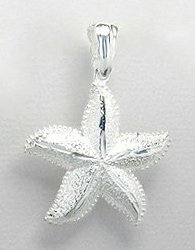 This sterling silver Sea Star pendant is very well designed. Take a closer look at the curves and bends all over and the arms look like they are writhing. 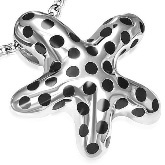 Although this sterling silver pendant is an artistic design, you'll have the impression it is life-like. 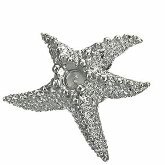 It is finished in high polish and textured in parts to appear like the spiny skin on Starfish. (Chain is not included) Recommended chains are shown below. 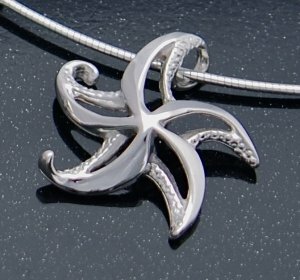 This design is also available as a Pewter Necklace and as a Bronze Necklace. These 2 chains match all the pendants above. 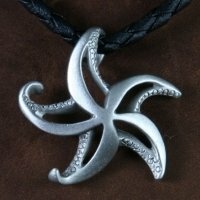 sterling silver rope chain is another good option. Model 544 is well lined with Marcasite gemstones. 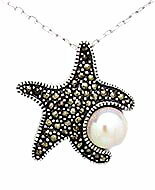 Oh, this star certainly shines, with subtle lustre like the freshwater pearl right beside. 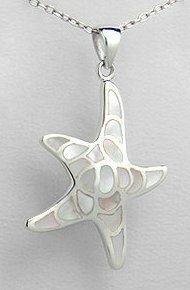 Cable Chain B and the Snake Chain are also the matching chains for the beach ready pendant 715 below. The Sand, Shells and Starfishes look real, don't they? That's because they are! 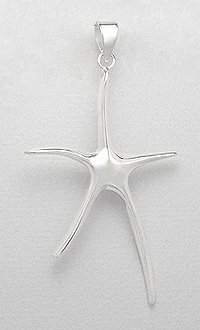 This beautiful pendant model features a real Starfish with shells and sand held together by resin. Despite the size, the pendant is light. 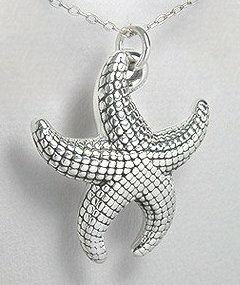 Are you concerned your starfish jewelry gifts will not be appreciated? 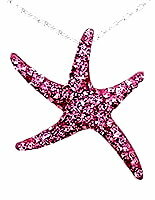 We have created ‘Gift Enhancers’ like Into the Deep to turn your starfish jewelry into perfect gifts. 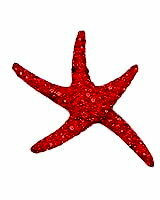 Sea Stars are naturally beautiful. 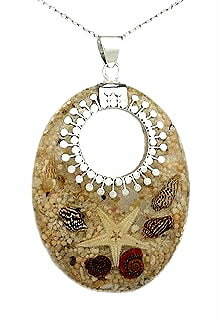 In this design, natural shells are used unnaturally to create beautiful Sea Stars. 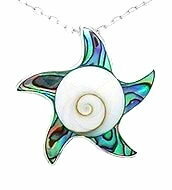 A Shiva Shell disc lies in the center and Abalone Shells or white Mother of Pearl form the rays. 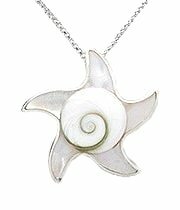 Cable Chain B and the Box Chain are also the matching chains for the inlaid Mother of Pearl pendant 936 below. Looks like a happy Starfish, doesn't it? 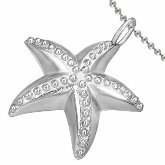 Twinkle, twinkle, little Sea Star... 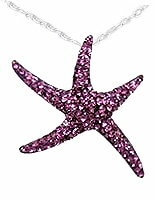 These come in attractive colors and paved with bright sparkling crystals. These stars sure shine brightly. Rose Pink, Purple, Orange and Light Blue. See your favorite color?  sterling silver Cable Chain A, a much thinner version of sterling silver Cable Chain B. 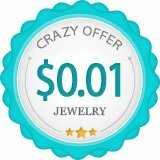 Go for this chain if you prefer thinner chains and you'll save quite a bit too! 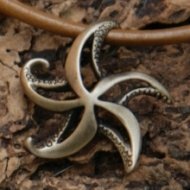 This Sea Star design is a variation of the ones above. 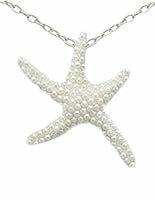 Instead of crystals, you enjoy the lustre of numerous pearl-like beads! 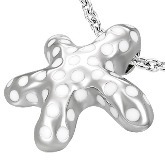 For a pearly Sea Star necklace, match it with Cable Chain B or Cable Chain A as above. Here's another Sea Star that is unique and wonderful - it is made of wood! And embellished with beautifully polished sterling silver discs. The combination and contrast are spectacular! For a thick 2 inch pendant, it is really light as it is mainly wood. A thick chain is not really required. it is photographed with will do just fine. will give you a better looking Sea Star necklace. 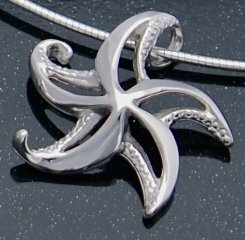 Although we are mainly into sterling silver jewelry, our designs do extend to other materials. 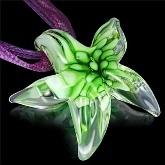 When it comes to Starfishes, we are fond of glass designs as well. The purple cord and lace is 17 inch with a 1-inch extender. The red cord and lace is 17 inch with a 1-inch extender. What else can I say? 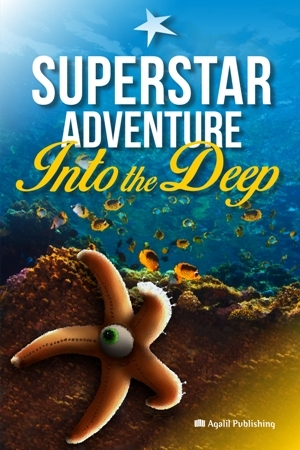 This Sea Star is 'star-studded'. 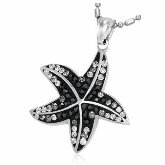 The whole stainless steel Sea Star pendant is pave-set with clear, grey and black Cubic Zirconias. The color gradient from dark in the middle to bright at the ends. 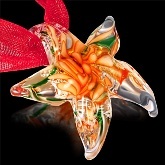 Bright and beautiful, it's a 'Star'! 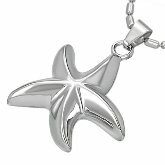 Buy a stainless steel Star fish pendant or necklace. 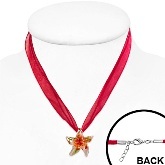 Finding a matching chain involves trying out chains of various designs and thicknesses. We have done that for you so you don't have to. 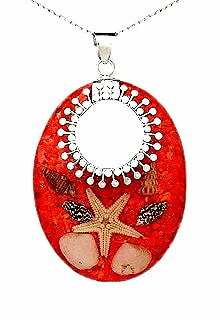 From here on I'll be showing you pendants followed by necklaces of the same design with matching chains. Don't think I can keep this up - showing you one sparkling Sea Star after another but here's another one. It is PVD-plated in gold and I'm glad we can offer you this color option. 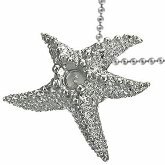 The stainless steel starfish necklaces and pendants on this page are made of 316L surgical steel. Wow, this looks really good - the contrast between the brilliant high polish stainless steel and black dots. Take note of the dimensions. 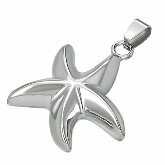 This stainless steel Sea Star pendant comes in a good size. It is fleshy and shapely too! This is a variation of the above, with white dots instead of black. 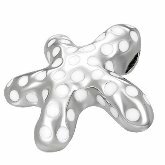 This stainless steel pendant has a good thickness for a more pronounced 3-dimensional look and the bright shiny surface you'd expect from well polished stainless steel jewelry. 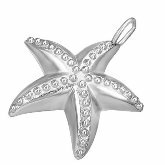 As you have probably noticed, Starfish are spiny-skinned and much effort is made to texture and add details to make this stainless steel pendant look like the real thing - with bony, calcified skin, which protects Starfish from predators. This is a well-fed Sea Star with fleshy arms. 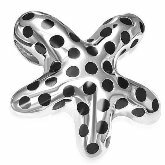 To add textural interest, the top of the Starfish has a matte finish in contrast to its other parts in a glossy finish.